Pet birds will also suffer depression. Most cases of depressed pet birds were found on parrots because parrots are high intelligent and extremely emotional among birds, also parrots are the most popular pet birds that people raise. People won’t sense a wild bird depressed. What will a parrot do when it’s depressed? The depressed parrots will pluck their feathers. This is the most easily recognizable sign that a bird is depressed when it doesn’t have a pal and you just ignore him recently. The parrot bob his head up and down all a day. The parrot presents an appetite loss. Stress bars show up on the feathers. Fully check your parrot and make certain that there isn’t a medical issue in play with the above symptoms, then you pet bird may be very possible to get depressed. Why does a parrot get depressed? 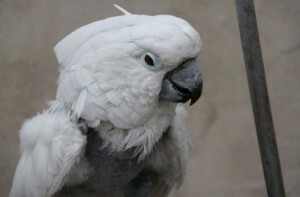 Most of the depressed bird cases indicate that a parrot get depressed mainly because of being lonely. A parrot is put alone in a place without a pal or the bird owner doesn’t play with him often, then it may get depressed. In addition, the poor living environment will also cause the depression of a parrot. How to cure a parrot’s depression? The owner should play with the parrot more often and better to buy it another parrot as a pal. It’s a good idea to provide your parrot with some new and interesting toys. 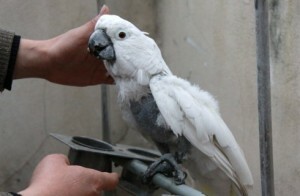 These are not only to cure the parrot’s depression, but also a prevention. Check if your parrot’s cage and living area are clean and comfortable with enough space. Many cases show the bird’s depression can be caused by an uncomfortable living environment. The parrot gets depressed to bit off its feathers because his companion has gone. The owner is comforting the depressed parrot. 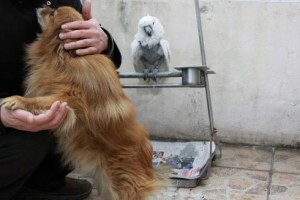 The owner even has a pet dog to be with the lonely parrot. 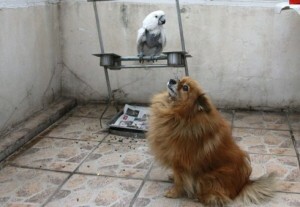 The parrot dislike the dog and the owner decide to buy another parrot to be its new companion.